Here is the third (and normally the last) episode of my series about gift sent by postal administrations. Today I’ll speak about the gift I received from the Swedish post. I have a subscription for new issues from Sweden, so to thank me of my fidelity, I receive this very nice engraving. Nice, isn’t it ? It was included in a presentation pack. Here is the complete object. 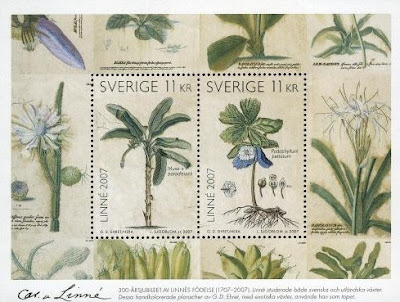 This engraving re-uses the design of two stamps issued in a souvenir sheet on the 10th of May 2007 to celebrate the 300th anniversary of the birth of Linnaeus. Here is the souvenir sheet, as a reference. First let me say a word about Linnaeus. 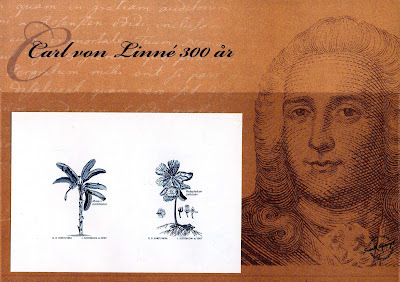 Carl Linnaeus (1707-1778) (known as Carl von Linné after his ennoblement by the Swedish king Adolf Fredrik in 1757) was a Swedish botanist, physician and zoologist. He is sometimes referred as the father of modern taxonomy. His most famous work, Systema Naturae, published for the first time in 1735, established the foundation for the modern scheme of nomenclature. The Linnaean system classified Nature within a hierarchy, starting with three kingdoms : Animalia (for animals), Vegetabilia (for plants) and Mineralia (for minerals). Kingdoms were then divided into Classes, divided into Orders. Each Order was divided into Genera and then Species. The groupings were based upon shared physical characteristics. To this day, only his groupings for animals remain, and even the groupings have changed significantly since Linnaeus’ time. 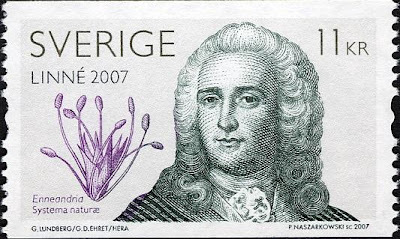 If you look at scientific names of some animals, you will see that a lot of them are followed by the indication “Linnaeus”, indicating that they have been classified by him.Swedish posts has also issued a stamp picturing a portrait of Linnaeus, on the 25th January 2007. Here it is. 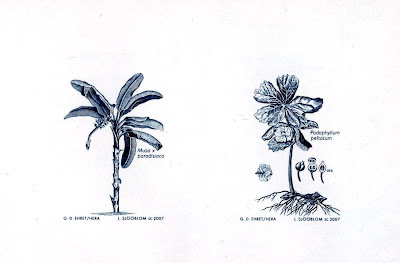 The plants that are pictured on the souvenir sheet and on the engraving are : on the left, Musa x paradisiacal, a sort of banana tree, and on the right Padophyllum peltatum, commonly known as the Mayapple. A funny anecdote about the last one : despite of its name, this is the flower that appears in May, the apple appearing normally in the summer. It is sometimes called the Devil’s apple or the Wild lemon (because of its taste). Only the fruit of the Mayapple tree can be eaten, the plant itself can kill a human in 24 hours !